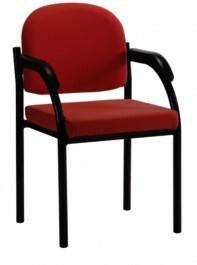 HERTFORD 01 FULLY WELDED FRAME HEAVY DUTY ARM CHAIR Arm Chair Stackable 5 High Incorporates a Well Padded Seat And Back For Complete Comfort, the arm rest are designed for easy clean with Black PU Soft Arm Pads, The Arm rest flare out for comfort leaving access to clean inbetween the arms rest and back rest. UK Manufactured. 5 Year Guarantee. The HERTFORD Range of Steel Framed Office Chairs Are Fantastic Value, Made To Order & Usually Shipped In 7-10 Days Of Order.